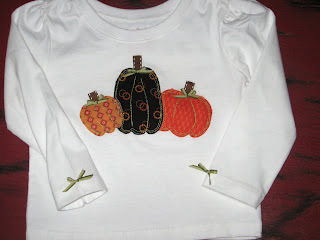 Cute pumpkin shirt for Halloween AND Thanksgiving! Zoned out on Elmo!...me? Trying out my new flash unit using the wireless mode! 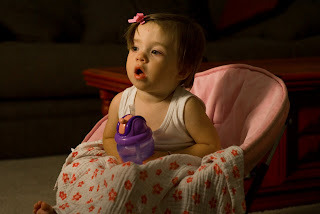 I am sitting to Amelia's left and the flash is set on the TV pointed towards the wall as a bounce flash! Cool! Miss Amelia is learning how to run! Crazy weather, eehh? Friday it was blazing hot, Saturday hot and windy, today rain and cold breezes. I love this time of year! I was so inspired by the weather I made a new appliqued shirt for Amelia!! Friday was a stressful day for me. My goal was to get our Visas to Jordan completed and mailed off. I left at 9 am in order to get back home by 11 for my visiting teacher to come over. I was at Walmart trying to get three money orders to pay for the Visas. The line was about 15 people long and waiting was taking forever. Charity called while I was waiting in line saying she was at my house and needed to get into the townhouse to show a potential renter. I was NOT about to get out of line. So, I waited another 15 minutes not even moving. Frustrated I went home to drop off the key...it was the wrong one. The rogue key was hidden on Justin's dresser. I decided to try the bank for the money orders. That was much better. The teller even waived the $12 fee because she didn't want to fill out the paperwork. Nice. Next stop was to the Post Office. At the Post Office I realized that I had no idea who to make the money orders out to. I called Justin to look on the consulate website...nothing. I actually was childish enough to hang up on Justin because he was being difficult. Mom told me to make it out to the Hashimite Kingdom of Jordan Consulate Washington DC. Phew. OK. It took me about 30 minutes to get the paperwork completed, organized, stamped, and paid for. The postal fee of $95 was more than the Visas ($94.50). I about crapped a brick when the guy told me it was $95 to mail the two envelopes. I could practically fly to DC and back for that amount! We now have a new renter next door. The carpet was laid Tuesday and Wednesday. Kenny finished painting on Friday, it was advertised for the first time on Thursday. Rented and contracted out Friday morning! That was really fast. Friday evening we helped out Kenny to finish some cleaning before the lady moves in. I have yet to meet her and her 4 year old niece. Saturday I decided it would be a good idea to ride out to Saltair and back. It was mildly windy on the way out and horrendous on the way back. The wind must have stirred up some allergens because within 30 minutes of finishing my 24 mile ride I had a BAD case of post-nasal drip. Yay, that turned into a full blown sinus infection within 12 hours. Now I am feeling pretty under the weather. Still, we went out to get some hot and sour soup and play with Amelia at Liberty Park. She was so cute running all over the place. The water area was still open so we let her get her feet wet...ended up going for a swim. 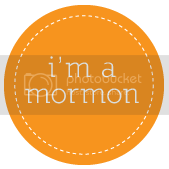 Today I went to sacrament meeting, came home and went to sleep around 10:20, napped until 1:30. That was a good nap. My head and allergies are not so bad after a long nap. Justin and I enjoyed introducing Amelia to the rain this evening. We haven't seen it enough to make an impression on her. I sang "Rain, rain go away" while standing out in the rain. She laughed and tried to say rain, "wayn". Now Justin is introducing her to Mary Poppins. She danced in her chair to Chim-chim-cherry. Looking back now, our life as single and married seems dull. Amelia is a huge ray of brilliant sunshine and rainbows.